Under recently enacted legislation, local agencies in California are required for the first time to manage groundwater pumping and recharge sustainably. The law empowers local groundwater agencies to manage and use groundwater “without causing undesirable results,” leaving it up to them to determine how to best achieve this goal. 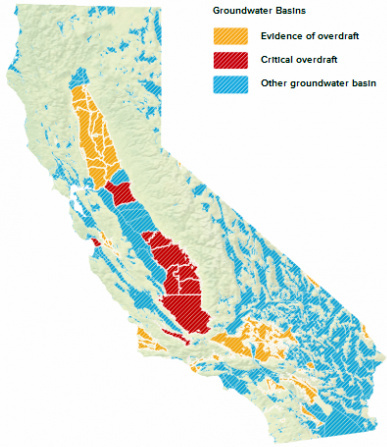 Within the next six to eight years, agencies in groundwater basins subject to critical overdraft must adopt plans that put these areas on a path to sustainability by 2040. A major factor complicating such long-term water planning is climate change. Failing to account for a changing climate will put agencies at risk of “undesirable results,” even if they are otherwise well prepared. California has already experienced shifts in runoff from spring to winter. Scientists predict continued shrinking in snowpack and increased variability in temperature and precipitation, resulting in more frequent heat waves, longer droughts and more intense floods. For groundwater, this means demand will rise in dry times, particularly for irrigation, and recharge will be less consistent. In times of water scarcity, groundwater provides more than 60 percent of water supply in some regions, compared with about 38 percent of California’s total water supply in normal years. Modernizing and sustainably managing groundwater basins lays the foundation for climate change readiness, but more actions can be taken. The key is to make the system more reliable. Adaptation strategies such as groundwater banking and managed aquifer recharge can help. But for the long term, to protect against more erratic water availability under climate change, a thoroughly integrated approach to water management is needed. Managing groundwater, surface water and stormwater systems conjunctively, along with innovative water efficiency and conservation strategies, will help stabilize if not increase the amount of water available for use. For example, Orange County Water Districtreports that implementing an integrated approach to water resources management allowed the district to more than double yield from their groundwater basin. Clearly defined groundwater rights make management more secure so people can trade water if they so choose. At the least, managing for climate change will help local groundwater agencies prepare for natural climate variability. Recent analysis of tree rings in central California found that in the past 2,000 years the region often experiences periods of 14-16 years of overall wetness or dryness – a duration that exceeds many of todays’ water-planning horizons. Managing for natural variability, such as 14-16 years of below-average dryness (or, better, for droughts lasting more than 100 years as occurred in medieval California), will make it easier to manage other local problems, such as evaporative losses. Taking a long-term approach to groundwater management will result in more resilient groundwater basins and a more secure water system for California. Lauren Adams is a graduate student in water resources engineering and a 2014 fellow with the Integrative Graduate Education Research and Traineeship (IGERT) program at UC Davis. She was an organizer of an IGERT workshop in April on California groundwater and climate change. IGERT fellows Amanda Fencl and Katie Markovich contributed to this blog. Originally posted at CA Water Blog.